Thanks to all those that participated in last weeks battle. The winner was Tokyo Wars, which won by one vote. Time for a new battle, this week: Konami’s Dance Dance Revolution Vs. Andamiro’s Pump It Up. It’s not holiday themed but there aren’t many holiday themed arcade games to go off of really so we’ll leave it at that (and no one suggested any ideas – if you have an idea, leave a comment or post in the forums). A couple of days ago we posted about a new Konami bemani title called Jubeat but we didn’t have information to go on about it. 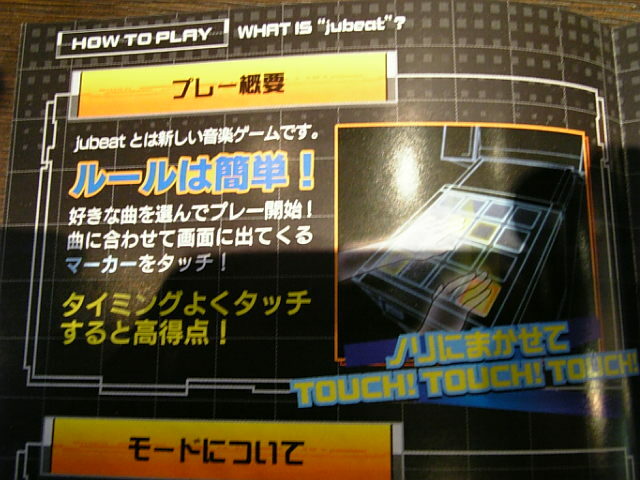 Thanks to The Stinger Report, here is an image of the playfield – it looks like this one is controlled by the hands instead of the feet and as such has quite a few more buttons to use than DDR does.